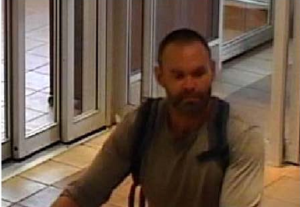 (Ottawa) – The Ottawa Police Central Criminal Investigations Unit is investigating a theft that occurred in the West end of Ottawa on July 30, 2018. All investigative avenues have been pursued and police are now asking for the public’s help in identifying the suspect. The suspect is described as a white male, short hair, full beard. He was wearing a grey, long sleeve shirt and was seen carrying a backpack (see photo). Anyone with information regarding this investigation is asked to call Ottawa Police Service at 613-236-1222, ext. 5166. Anonymous tips can be submitted by calling Crime Stoppers toll-free at 1-800-222-8477 (TIPS), or by downloading the Ottawa Police app.